Martial Views: Self-Defense or Offense? Celebrated political commentator, Noam Chomsky, recently derided the term, "National Defense", stating that a more appropriate expression would be, "National Offense". The term, "Self-Defense", is so synonymous with the martial arts, it's almost cliche. What's amazing is that conflict resolutions are usually abandoned in favor of physical combat. How can a system preach self-defense that focuses almost exclusively on punches, kicks, throws and other forms of attack? 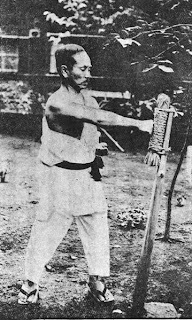 One of the precepts of the Bubishi, an ancient Chinese text, states, "Action to strike is when the opportunity presents itself". "Opportunity" historically has been linked to the acquisition of territory, the notion that one's religious views are superior to others, etc. Is nationalism or one's belief in God worth dying for? Fighting will always beget fighting. Always. True self-defense starts with peaceful intent. To quote another line from the Bubishi: "A person's heart is the same as Heaven and Earth." It's time to transcend the earthly concept of waging war.